Sea Salt & Black Peppercorns / Mini Grinder Set...hand harvested sea salt fro South Africa's pristine west coast & hand picked spicy, aromatic Piper Nigrum unrefined whole peppercorns. The Sea Salt & Peppercorns Mini Grinder Set are Perfect as gifts, for camping, picnics, boating & more. 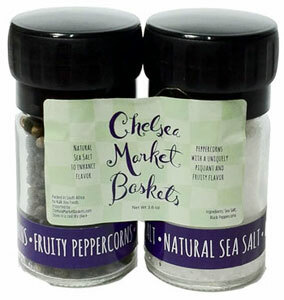 Sea Salt & Black Peppercorns / Mini Grinder Set. Size: Salt 2.1 oz., Peppercorns 1.3 0z. Ingredients: Sea Salt, Black Peppercorns.